Caden wanted me to play Super Mario on Wii today and out of parental guilt over everything that I wanted us to do over summer break and we never quite seemed to get around to, I agreed. This was one of those proverbial train wrecks because he’s really good at video games and I’m really not good at video games and if on the hap chance I do something right and accidentally win, it usually causes an epic melt down (something I should mention that we are working on….his meltdowns, not trying to increase my accidental wins). Caden was being particularly generous today with his mental energy and time and was thus trying to explain to me what I was supposed to be doing (lesson 1—I was holding the remote up and down instead of sideways…oops) and not doing. It was all very confusing and I wasn’t apparently a very good student since I spent more time in the oops bubble floating around than actually moving forward in the maze or track or world or whatever it is called. Nothing really matched up to my expectations; I started to wonder if that’s a little slice of what it’s like to see the world differently than most folks. The little turtles were so cute and seemed to be enthusiastically running toward me in the game so I wanted to run toward them. It was quite the shock to find out that they were one of those “bad” things that put my character into a bubble and cost me one of my turns. Caden gets so much joy from lining things up by color, shape, size, function or whatever organizational category he chooses at that moment. I wonder if he is shocked when others don’t appreciate that as much as he does or if he wonders why others aren’t enjoying the rainbows that he always seem to find reflecting off of windows (or really even taking the time to look for)? Then there are these tunnels in the game that just seem like trouble to me but yet when I’d accidentally fall down one (or Caden’s character would push me so that he’d get extra points) all of a sudden we would be in an underground tunnel full of extra coins with no danger anywhere in sight. Maybe while spinning until you fall down or laying under the bean bag chair seems like an inherently bad idea, it turns out to be an unexpectedly pleasant sensation. I wonder then how many things that seem negative really turn out to be okay or that seem okay turn out to be scary somehow. Maybe as adults we just randomly determine that the birthday song is fun for parties, high pitch nonsensical songs are for preschoolers, that babies like people popping out from behind hands shouting peek-a-boo, or that kids who spend their lives being told to watch out for strangers should then like having their cheeks pinched or tummies tickled by those same strangers in “safe” places like the grocery store just because the person is old enough to be someone’s grandma or grandpa as a way of measuring if we are being fun child-friendly people. So I started to wonder if maybe what I want to strive for in my life isn’t so much autism specific awareness but just a general realization that kids are individuals and they may or may not see the same things as us. And that’s not a bad thing—have you ever noticed how much fun kids can have just being, or how uninhibited kids are if they want to start singing in the middle of a crowd, or how they can wear pink and orange just because they like those colors. They don’t necessarily start to worry about being different until we teach them that different is somehow bad. Yet different is what inspires the courage to make real change. It’s been a busy week of “firsts” for us in service dog world. On Monday we started out with Elf at the vet’s office for a routine check, vaccines necessary in our area, and to pick up flea and heartworm medications. I have a really long list of things that I think I would suggest that people consider before getting a service dog, not as a deterrent but more of a reality check to make sure the individual fully comprehends what he or she is signing on for. We have a zoo and are painfully familiar with vet costs but I wonder if Monday’s $220 bill would come as a shock to some or the $40 for a bag of premium dog food might cause a wrinkle in other’s monthly budgets. Granted much of the costs incurred by a service dog are deductible for some on yearly taxes but you still have to be able to pay for those as you incur them. Maybe I should put together my considerations list and make it available in case others might find it useful….something to think about. Ironically after Elf’s routine appointment, we then had well check-ups for both kids. Ironic in that we were getting all 3 “kids” ready for the school year and ironic in that our kids have primary immune deficiencies, there’s no such thing as well. The doctor was running about 2 hours late but Elf just used the down time (and cool tile in the exam room) as an excuse to nap—wish I could say the same about my kids. Honestly he was the only one not climbing the walls by the time we left 2.5 hours later. No problems at the clinic other than lots of kids wanting to pet the big teddy bear and Elf wanting to roll over so everyone could scratch his belly. The rest of the week has included Elf and Caden visiting Ryley in the hospital during her monthly infusion and various other stops around town. He was most definitely welcome and a hit on the pediatrics floor. Although I’m not sure Caden really understands all of the attention he is definitely proud to say Elf is his. He has been doing a great job holding onto either his little leash or the handle on Elf’s harness. After a few more successes, I think we’ll expand to actual tethering with Caden wearing a belt or backpack that we can attach the tether to. I want tethering in big crowds but I’m starting to wonder if just having the leash or handle is enough in most situations to keep Caden close by; he thinks that he’s holding onto Elf so Elf doesn’t get lost! Other firsts for Elf this week have included the trampoline (which he hated), the kids’ teaching him to drink out of their water bottles (which he loved), Caden’s desire for him to learn how to go up and down the slide at the park (which he isn't sure about), and a startling realization that if the little fuzzy cat who looks like she'd be a lot of fun to play with says no, she really really means no (lesson learned). He also learned this week that if you are hot and you pick the water bowl up and flip it, it will dump all of you and the ground around you so that you can have a lovely soak (a trick I'm not as fond of). Autism is still in full force so we have reluctantly asked for a referral to a developmental pediatrician and therapist to see if they have any ideas that we are comfortable with. 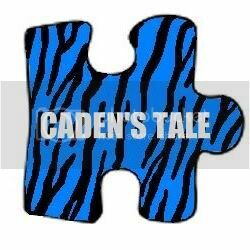 As some of you know we’ve developed and handle most of Caden’s therapies ourselves because there hasn’t been one program that we felt comfortable with and that we thought would really benefit Caden (with the exception of speech). Honestly we are out of ideas at the moment but there’s nothing like a dev ped or therapist ticking us off to stimulate a whole host of our own new ideas---sometimes you need your creative juices sparked. Interestingly for us, that usually happens when the “experts” make suggestions that we know are ridiculous for our child and would never work in our daily lives. The problem usually revolves around the therapists wanting a strict schedule and routine and honestly when you have 2 kids who get sick quickly, often, and severely the last thing you want is a therapy plan that doesn’t have room for deviation. Unfortunately our beagle’s attitude is still in full force as well. We are currently engaging in squirt bottle therapy at our vet’s suggestion but given that she despises correction and water almost as much as Elf I’m not entirely sure how successful that’s going to be. Maybe it is just time that I sit her down for a heart to heart---heck I figure I have as much of a chance of her listening to me as I do with the kids—at least I can bribe her with dog bones so she’ll at least pretend like she’s listening to me! So Kodak moment parenting was in full effect about a month ago late at night when I got the brilliant idea that we should have a birthday party for Caden. You know a real birthday party where we invited other kids and had games and cake. Great idea part 2 was when I decided it should be at Chuck E Cheese because Ryley had her 5th birthday party there and still talks about how much fun it was. Not to mention I figured that Chuck E Cheese was the best way I could think of to ensure that kids would want to come and that their parents would want to bring them because it saves them an often dreaded trip to well Chuck E Cheese…the place where a kid can be a kid and adults would rather not enter. Now let’s realistically break down this idea and the potential problems. First there is the fact that it is sensory overload world and for a child with autism and sensory processing disorder all of the high pitch sounds and flashing lights not to mention 7 foot tall mice who sing the dreaded Happy Birthday Song this is almost a guaranteed meltdown. Then there’s the fact that on a Sunday afternoon the place is usually packed and Caden has only been at Chuck E Cheese once and it was several years ago. Add in the birthday boy crown and a hostess who may or may not understand autism and this is a recipe for disaster. Honestly as we left home today about 12:40 my stomach was in knots. I hadn’t told Caden who had rsvp’d so that any no shows or unexpected arrivals wouldn’t throw him. I still had no idea how he would react and it was making me more than nervous. I also realized that it was the first time since August 3rd that we were going someplace without Elf. As much as I would have liked to take him, it just didn’t seem like the best environment for him and so we decided to spare him the trip and allowed him some R&R time at home in his kennel. He went happily into his kennel but honestly for Dan and me it felt a little like the first time we left one of the kids with a babysitter. We got into the car but it just felt wrong driving down the road without Elf in the backseat. Unlike most of my Kodak moment parenting stories, this one actually turned out pretty well. Caden loved the tokens, games, and tickets concept. The kids pretty much got their tokens and headed their own ways to play games so there was little social interaction to worry about. Ryley and one of her friends knew all of the younger kids there since they are all in the same school and helped us make sure everyone was playing and having fun. The time at the table was less successful as Caden still doesn’t like the Birthday song and likes Chuck E the mouse more on television than he does in real life but he handled it by sitting on his daddy’s lap---no tears, screams for help, or hiding under the table. No public proclamations of bathroom activities and no clothing removed. All in all I’m proclaiming a success and Caden is just so thrilled that his friends were there and that he had a birthday party. I did notice something else today though. I have always thought of putting my make up on sort of as my way of preparing for the world, even maybe a form of war paint. I just realized though that I put on one of my autism shirts without even thinking about it. I suppose subconsciously it was my way of reminding the kids’ parents that Caden has autism as well as anyone else that might look our way. Looking back on our pictures from 4 Paws training I noticed that I wore an autism shirt for our first day of training and our first public trip to the Mall with Elf. Maybe it’s my way of handling the stares or trying to avoid the rude comments that inevitably come with the territory of autism. I’m always amazed at how opinionated people are when it comes to a child acting differently in public and how people always seem to assume the worse. I’m not going to win any parenting contests or receive sainthood any time in the near future but I can fairly confidently say that having a child with autism has greatly increased my tolerance of children’s behaviors in public because I’m always wondering if there might be a neurological, mental, or physical condition that I can’t see. Honestly what I have found is that it doesn’t take any more energy on my part to give children the benefit of the doubt than it does to pass judgment. I get asked sometimes why I share so much about our family on a public blog. I guess I want to believe that discrimination occurs because people naturally fear the unknown and maybe by sharing our daily lives with others, it’ll take some of the unknown away and make it a little easier for others to stop and think twice before they pass judgment.